Attorney R. K. Walton was the speaker Monday night at the regular meeting of the Stenographers’ Equal Suffrage league, held under the auspices of the Oregon State Equal Suffrage league in its headquarters in the Selling building. Mr. Walton spoke on the value of organization, pointing out that stenographers are peculiarly fitted for the ballot, because of the generally wide business knowledge most of them possess, and the necessity for them to be well versed in general topics. 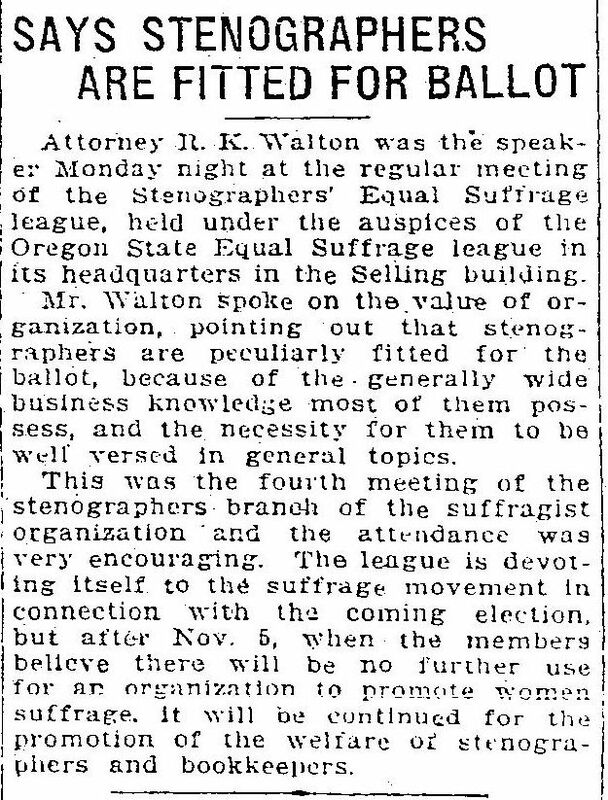 This was the fourth meeting of the stenographers branch of the suffragist organization and the attendance was very encouraging. The league is devoting itself to the suffrage movement in connection with the coming election, but after Nov. 5, when the members believe there will be no further use for an organization to promote women suffrage. It will be continued for the promotion of the welfare of stenographers and bookkeepers.